As you might already know that Telegram has been blocked in Russia and Iran so now it is a time for raising a proxy question. 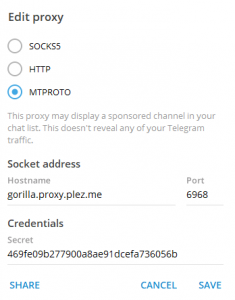 Telegram has officially released their proxy and it is open source (written in C programming language). But this can be compiled only on Linux. The tutorial says “simply run make” but that is not true. It is not that simple as it was excpected. But I’m here to provide a super easy way to install an MTProto Proxy on your Linux VPS from zero. Note: this article was originally written in English, please view the English version for better understanding and ignoring automatic translations. VPS/VDS (it is recommended to use cloud VPS). I don’t suggest you to use OVH as it blocks telegram since some time or use VPN to forward all traffic via encrypted tunnels. It’s not recommended to use VPS located in Russia of course. I won’t be advertising any of the providers there are many, just find the best for you. Note: If you are on Windows PC you will need Putty to connect to your server. Note: we don’t setup the promotion channel yet. It will be done later. This is because in this tutorial we assume that you don’t have access to Telegram at all, but you have managed to get Android/iOS/Desktop client and can’t connect. So that’s why we set up the proxy first, then connecting over it and only when we have access we will set promoted channel. And search for “Secret 1: 469fe09b277900a8ae91dcefa736056b”. So, now in Telegram client enter Hostname = IP of your VPS or a domain name pointed to this ip (it’s your VPS IP address you used for connecting using SSH), then port (in this case 6968) and the secret from message above, and pless SAVE or CONNECT. And yes, you can use this proxy too (if it will available). “Success!Your proxy has been successfully registered. You can now pass this proxy tag to the software you are using: 1d3eb6dd135e4aaff7de0fd614124b4c.” Copy the hash of proxy tag “1d3eb6dd135e4aaff7de0fd614124b4c“, it will be needed further. Send another command to bot: “/myproxies”. He will list your new created proxy and you need to select it, then choose “Set promotion” and send him a link to your channel. WORKERS=0 – you can set this to any value you want, but for a little server 1 worker is enough (Zero means 1 main process + 0 slave processes). If you want to have 2 processes, set it to 1. SECRET=469fe09b277900a8ae91dcefa736056b – pass the same secret from step 2. Or any other 32 characters hash (you can use md5), just don’t forget then to set this password in your client too. I recommend to use the same from step 2. TAG=1d3eb6dd135e4aaff7de0fd614124b4c – Tag, that you got from the bot in step 3. And that’s all. Now the users of your proxy will see a promoted channel. 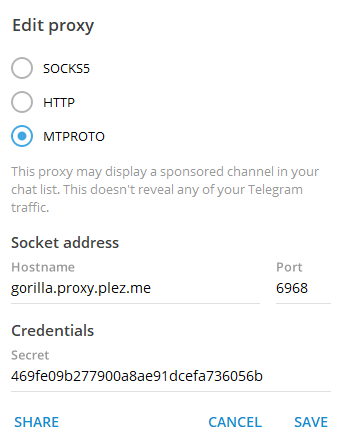 If you feel quite experienced, visit the https://hub.docker.com/r/telegrammessenger/proxy to get more info. Visit the page of my fork for PHP MTProxy on GitHub as you also will find information and links to other proxy implementations. But they doesn’t support promoting channels yet. World! labor! May! Sophisticated week is not over yet. Xbox emulator for Joey "Logitech Rumble Pad 2"
Assassin's Creed: Unity - There is hope!